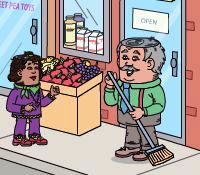 Grandpa John is busy sweeping the sidewalk, in front of his store, when he sees Nellie coming down the street. He can see that Nellie is crying. She looks so sad! Nellie stops in front of Grandpa John. She sniffles, wipes away her tears and says, “I’m so sad. My best friend, Minnie, is moving away today. She and her family are moving across the country because Minnie’s dad got a new job.” Then Nellie starts crying all over again. They go into the store, and Grandpa John grabs two bottles of all-natural fruit juice. He opens them, and he gives one to Nellie. They sit down on two wicker chairs in the corner of the store, and Nellie begins to talk about Minne’s leaving. “Minnie is my best friend. We play together every day, after school, and on weekends. What will I do without her? When will I see her again? Who will I tell all my important stuff to?” A big tear rolls down Nellie’s cheek and she starts sniffling again. You are currently browsing the archives for the Nellie category.